Scores of nurses are pursuing the baccalaureate degree in nursing and other advanced degrees in response to rapid and complex changes within healthcare. The RN to BSN program is a convenient way for nurses to prepare for greater responsibilities and executive positions in nursing. More health care employers require nurses to have a BSN degree as several studies show that BSNs have a positive impact on patients and achieve better results. According to a 2014 survey conducted by the American Association of Colleges of Nurses, 79.6 percent of employers require or prefer nurses educated at the BSN or higher. The trend of hiring more BSN employees is in part influenced by the American Nurses Credentialing Center (ANCC) Magnet Recognition Program®. This external but prestigious designation was developed to recognize healthcare organizations that provide nursing excellence. Those who receive the designation would have demonstrated their commitment to quality patient care, nursing excellence, and innovations in professional nursing practice. It helps consumers identify and select organizations that offer high-quality nursing, as it is the “gold standard” or nursing excellence. Since the Magnet Recognition Program emphasizes professional development and higher education for nurses, a substantial percentage of the nursing workforce will have or be on the path to the BSN. The good news for nurses is that Magnet-designated hospitals will have tuition programs in place to support higher education for nurses. The BSN staff at Magnet hospitals accounts for approximately 59 percent of the nursing staff. BSN completion programs give registered nurses additional skills and a broader perspective of nursing that equips them to meet the demands of a complex health care system, use technology to increase the effectiveness of care and to coordinate care among clinicians. Graduates are just as compassionate and empathetic, but they are better critical thinkers. Effective critical thinking leads nurses to quickly analyze patients and situations, and apply the standards of care with positive outcomes. BSN-prepared nurses will develop better plans of care, incorporating research to improve the quality of care delivered. The utilization of evidence-based practice and technology often results in lower mortality rates and complications after surgery. Registered nurses might also consider the personal benefits of completing the BSN. The baccalaureate degree facilitates more opportunities for furthering their careers. It opens the doors to positions in management, job diversification, promotions, graduate study, and job satisfaction. A working registered nurse might dwell on the challenges of returning to school, but the online RN to BSN program simplifies the process, giving nurses the opportunity to study while leaving time for work and other commitments. Those who complete the bachelor of science in nursing degree benefit from better job opportunities and higher salaries than RNs without a bachelor’s degree. Magnet recognition, an initiative of the American Nurses Credentialing Center that is awarded to hospitals that demonstrate excellence in nursing, quality in the patient care and innovation in professional nursing practice, is driving demand for bachelor’s degree nurses. Magnet hospitals hire more BSN-prepared nurses to maintain their status and to improve the positive patient outcomes. Studies have shown that nurses prepared at the BSN level can improve the quality of care delivered to patients. If you’re looking to move from the bedside to specialty care or some other position in nursing, a bachelor’s degree may be necessary. School nurses, flight nurses, travel nurses, and correctional nurses need additional knowledge, critical thinking, and judgment to get the job done. A BSN will cover the additional coursework needed to succeed in these areas. Public health nurses must have a thorough understanding of health promotion and disease prevention – areas that BSN program will cover. If you’re thinking of moving up into careers in management, education, research, or advanced practice, the BSN degree will set you on the path to an advanced degree. Nurse educators, nurse practitioners, and nurse managers are always in demand, but these specialized positions typically require a graduate degree. The BSN provides the foundational preparation to help you succeed in a graduate master’s or doctorate program. RN-to-BSN programs are on the rise across the nation. The prevalence of these programs comes in response to the volume of nurses going back to school to pursue advanced education. There are several motivating factors for returning to school, but one that drives many is the opportunity to master leadership skills, implement evidence-based practice, and deliver better care. These skills are essential for nurses for want to have a more significant role in the health care system. They will not only take on greater responsibilities but also improve patient satisfaction and quality improvement outcomes. The availability of online programs to complete the BSN is another important reason to get the BSN. Online study removes the biggest barrier to continued education for nurses. It gives RNs the unique opportunity to manage their studies while juggling a host of responsibilities. Employers also do their part to support nurses in their quest for continued education as they reap tremendous benefits from having highly trained and educated nurses on staff. Patients benefit as well. They win when nurses apply new techniques to support recovery and function as capable advocates on their behalf. There are several reasons why leading organizations advocate the bachelor’s degree for nurses. Numerous studies have been published in the public domain, reporting the relationship between patient outcomes and nurses’ education. 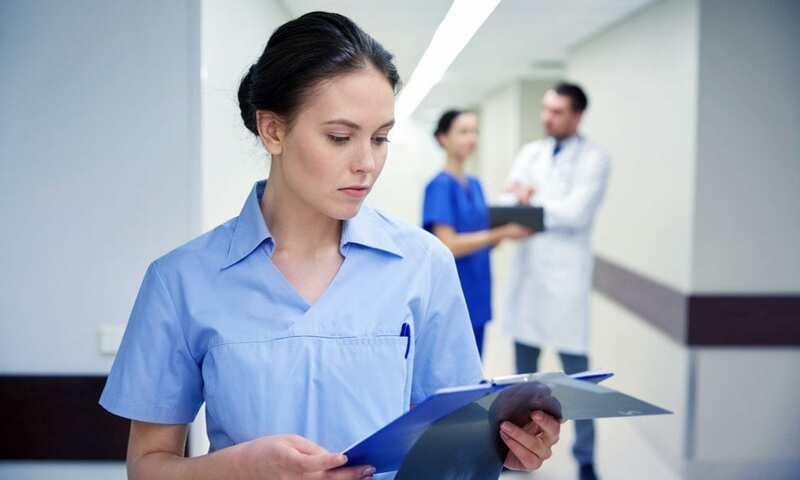 One study found that increasing the proportion or BSN nurses by just 10 percent could result in a 5 percent decrease in patient mortality rates and complications. Moreover, increasing the educational requirements will also improve patient safety, provide better surgical outcomes, and reduce the failure to rescue rate. Critical thinking, communication, leadership and clinical judgment are skills that were found to improve with more education. Online RN to BSN programs employ a flexible format that gives nurses an opportunity to prepare for career development. The holistic education prepares RNs to meet the complex challenges within the health care system. Students can complete the requirements to obtain baccalaureate degree (120 credits) in 12 months –depending on the school’s evaluation of the courses for transfer. At the conclusion of the program, graduates will have increased clinical skills, strong leadership, management, and organizational skills, clear critical thinking and decision-making skills, and the competency to use evidence-based data to improve the quality of care and patient outcomes. They will be better positioned to assume positions in hospitals, schools, clinics, home health, and other health care settings. A good RN to BSN program should be accredited by the Accreditation Commission for Education in Nursing (ACEN) or the Commission on Collegiate Nursing Education (CCNE) and recognized by the Board of Nursing. Accreditation is essential if you plan to pursue graduate study, need financial aid for the program, and if you want the respect and acknowledgment of employers. The program should also build on the technical skills gained in the associate’s degree program to develop critical thinking and a broader perspective of finance in healthcare, health care systems, and operations from the viewpoint of leadership. Consider the program’s flexibility and course scheduling if you plan to work and study. Review the curriculum. Does it cover the areas that will meet your goals for leadership or practice in a specialty area? Will it cover regulations, legislation, and future trends in nursing? Do you learn best online or in a traditional classroom setting? Keep these in mind when searching for a BSN completion program in Alaska or another state. Current RN licensure in the state of Alaska. Be accepted as a pre-nursing major at by UAA – this requires the evaluation of transcripts. Have a minimum GPA or 2.0. Maintain a grade C or better in courses required for the nursing major. Have completed at least 44 credits of prerequisite courses at the time of application. A completed application submitted prior to the November 1 deadline. Three letters of recommendation – two of them must be professional recommendations. Clinical requirements include documentation of CPR certification, evidence of immunization, HIV testing, results of a national level criminal background check, and personal medical insurance. Students must provide their own transportation to the clinical site. Previous college credits are evaluated for comparability to established requirements within the program and may be accepted for transfer. Also, credit by examination is available to satisfy some General Education Requirements. If you are a registered nurse, the total estimated cost of completing the RN-to-BSN at the University of Alaska Anchorage is $10,323. The estimate includes tuition and the cost of textbooks, supplies, equipment, parking, and immunization. Additional costs for completing the non-nursing course requirements will apply.